Tru-Hitch™ produces the XM20 FWTRD (Fifth Wheel Towing and Recovery Device), and the XM1234 TDRT (Tilt Deck Recovery Trailer) to meet the Towing and Recovery needs of the US Army both now and for the future. The TDRT was developed to replace the HMRT (High Mobility Recovery Trailer). The TDRT allows the operator to load from the rear without having to detach from the FWTRD. 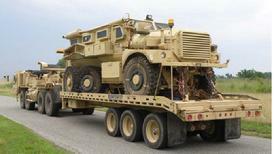 It features a deck that is expandable from 102" to 114" to accomodate MRAP class vehicles. The addition of a 35K Winch to the FWTRD has increased recovery capability and given the operator the ability to perform winch recovery at 90° to the prime mover. The FWTRD/TDRT is currently an approved Towing and Recovery method for the STRYKER/MRAP and is serving soldiers in both Iraq and Afganistan. 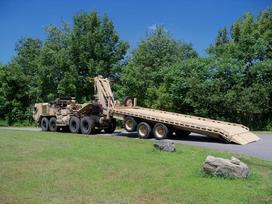 We are also proud to work with the Canadian Forces in the Recovery and Towing of their LAV. The FWTRD (Fifth Wheel Towing And Recovery Device) safely tows a full range of heavy military vehicles using existing fifth wheel tractors. Light-weight, compact, and air deployable, The FWTRD has wet line capability, a 35K Winch and an increased lift rating of 32,000 lbs and a 150,000 lb. GCWR. The FWTRD can be mounted, now or in the future, on any prime mover with a fifth wheel coupling. Currently approved prime movers for the US Army include the M915 series, M916 series, M920, M932, M818, M1088, M911, and the M983 as used for the Stryker Recovery System. The M983A4 is the approved prime mover for using the FWTRD with the TDRT (Tilt Deck Recovery Trailer). The FWTRD has several advantages over traditional military wreckers. A. With ever increasing weight of military trucks, the steering axle of a traditional axle becomes light and unsafe while towing. 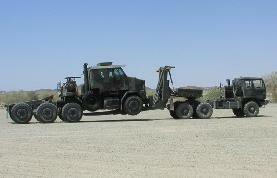 Because the FWTRD distributes weight evenly on all axles, even the heaviest military trucks can be towed safely. B. Military wreckers have speed restrictions while towing. Most towing with the FWTRD is approved for convoy speed. D. Wreckers add to maintenance costs. A FWTRD attaches to your existing tractors without the need to add trucks to your fleet. FWTRD/TDRT maintenance is simple and can mostly be done at field level. E. Full Range of Recovery Functions. A FWTRD with TDRT allows the operator to winch recover, lift tow, load, and trailer away in one modular package.